TRACKLIST 1. Len Leise - O Caminho 2. Len Leise - O Caminho (Len Leise Dub Version) 3. 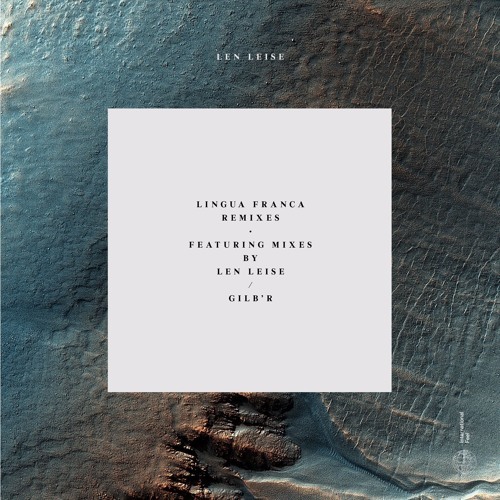 Len Leise - El Modelo (Gilb'R Remix) INFO Len Leise’s ‘Lingua Franca’ launched International Feel’s mini-album series (closely followed by the wonderful CFCF with ‘On Vacation’). ‘Lingua Franca’ reached critical acclaim and tipped into end of year charts from the likes of Thump and Vinyl Factory. Each mini-album will be followed by a twelve inch featuring a remix by the artist and another respected producer, so revisiting “2015's undoubted Balearic masterpiece” (Thump / Vice) are remixes from Gilb’r and Leise himself. Len Leise hits a mood and rides it. His album was heavily percussive, melancholy in places, happy in others and gloriously well balanced. For his remix he takes hold of ‘O Caminho’ and turns in a dub heavy ride of a track. Bass lines rumble and the congas move. Road tested in various nightclubs, it kicks when played loud. The original of ‘O Camino’ also makes an appearance on this package (one of the favourites from the album), and finally in comes Gilb’r to take on ‘El Modelo’. French native Gilb’r is a living legend in the house scene. He makes ridiculous records on his own, and also alongside the likes of I:Cube, as well as running the well-respected Versatile label. On initial listen his mix sounds stripped and industrial, but get lost in it and you can hear why he is so highly praised. It’s a timeless piece of house music made with the dancefloor in mind. So there we go. Another chapter in the wonderful world of Len Leise and International Feel. A star the making and a label always pushing the fold. nice! love this stripped-down version.